Cinecultist is all about The Puffy Chair these days, a small indie film made by the Duplass brothers on a shoestring budget, which is finally coming to New York for a run at the Angelicka starting this weekend. CC had a great chat with director Jay Duplass which is up on Gothamist now. For space considerations, we had to edit our interview down to the most pithy parts of Jay's responses and so didn't include this part where we discussed the great cluster of movie theaters in downtown New York. We were delighted learn though that Jay, like CC, is partial to the Cinema Village East from his salad days living here in the Eee Vee. The one thing I�m the most excited about with the Puffy Chair which doesn�t really mean that much is that when you open at the Angelicka, you most surely get a move over to the Cinema Village East, which isn�t a premier theater by any means. Everyone always asks me, What does it mean to have your movie showing up at movie theaters? How surreal is that? It doesn�t feel surreal at all, because three hours before every screening we�re running around the neighborhood. We�re putting flyers up and we�re making sure that the colors look right and that it�s not going to get screwed up. So it feels very hands on, it doesn�t feel like Warner Brothers picked up our movie and bombed it out to every theater in the country. But with the Cinema Village East, I think it�s going to mean a lot when it comes to my little neighborhood theater. That�s the one thing I�m looking forward to the most. Now that's what you call keepin' it real. Production still from The Puffy Chair starring Mark Duplass, co-written by Mark and Jay Duplass. 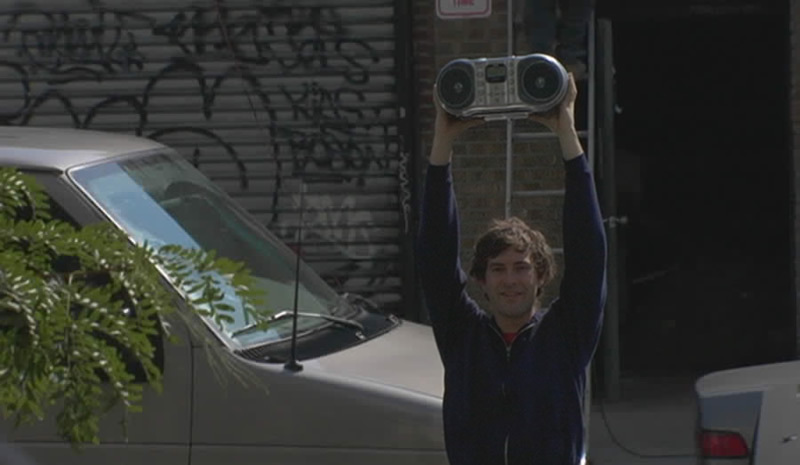 In this scene, Josh holds up his boombox to his girlfriend, Emily's apartment playing "Transatlanticism" by Death Cab for Cutie. As people who know our taste can attest, that was obviously the moment when Cinecultist knew we were deeply in love with this movie.